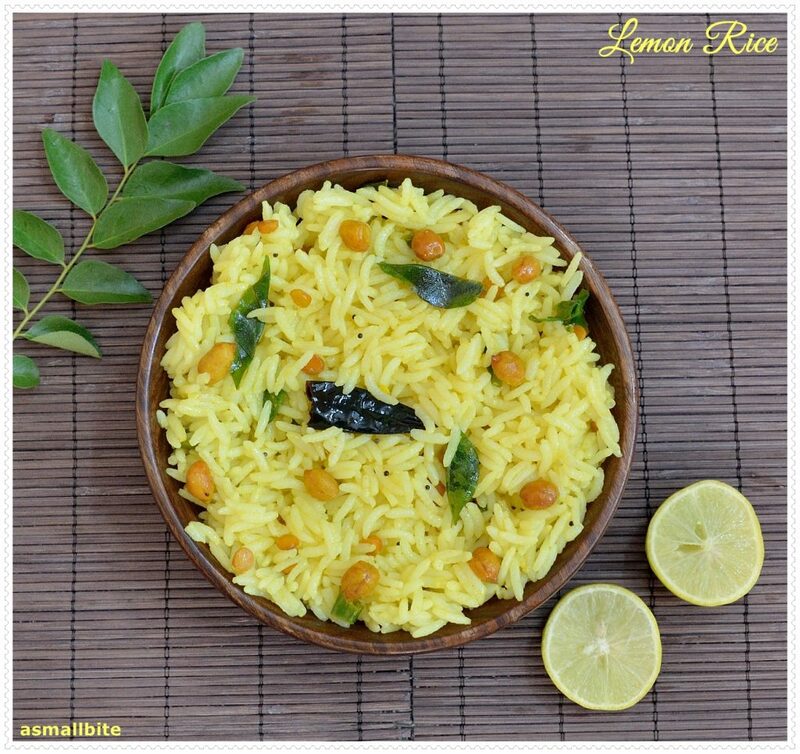 Lemon Rice Recipe / Easy Elumichai Sadham is a simple variety rice. 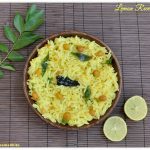 In Tamil Nadu cuisine, we make this Lemon Rice Recipe for Kaanum Pongal and Aadi 18. Pressure cook the rice with water ratio of 1 : 2 for 3 whistles. Add little salt and ½ tsp of oil while cooking. 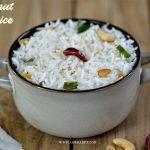 Fluff up the rice with fork and cool down. Chop green chilli's, crush ginger. Heat oil in a pan, add mustard and channa dal. Then add roasted peanuts, ginger, chilli's, hing and curry leaves. Fry till golden brown but not burnt. Add 1 tblsp of water, turmeric powder and salt. Give a quick stir and switch off the flame. Now squeeze lemon juice and add it to the cooled rice. Mix well and adjust salt. 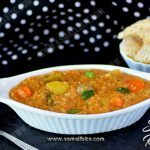 Serve this Easy Elumichai Sadham or Lemon Rice Recipe with any vadam or potato chips. 1. Pressure cook the rice with water ratio of 1:2 for 3 whistles. Add little salt and ½ tsp of oil while cooking. 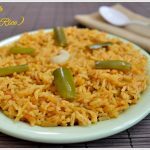 Fluff up the rice with fork and cool down. Chop green chilli’s, crush ginger. Heat oil in a pan, add mustard and channa dal. 2. Then add roasted peanuts, ginger, chilli’s, hing and curry leaves. Fry till golden brown but not burnt. 3. Add 1 tblsp of water, turmeric powder and salt. Give a quick stir and switch off the flame. 4. Now squeeze lemon juice and add it to the cooled rice. Mix well and adjust salt. You can also use any one type of chilli for tempering. 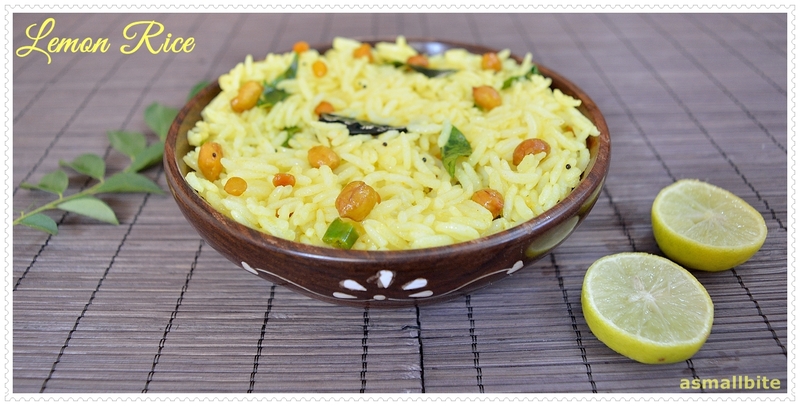 Adjust lemon juice and chilli’s as per your taste for the Lemon Rice Recipe. 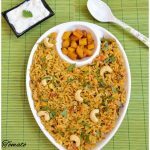 You can use any rice like basmati rice, long grain rice or even leftover rice to make this Easy Elumichai Sadham. Always switch off flame before adding lemon juice or else it will taste bitter and the vitamins in the lemon juice will be lost. Add turmeric powder generously for bright colour, hing and curry leaves for nice aroma.